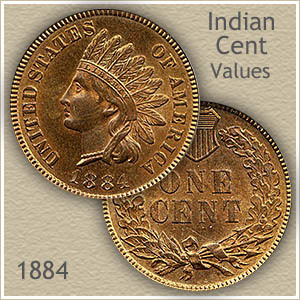 1884 Indian head penny value continues the run of higher valued 1880s coins. Your coin is a scarce date to find and needed by many collectors. However, many of the hazards of heavy use, over such a long period, results in old pennies enduring scrapes, bending, dents and lots of wear. 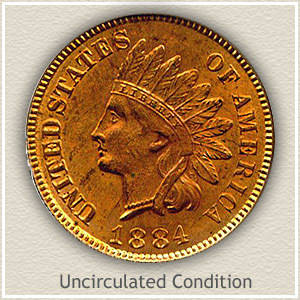 An 1884 Indian penny without these distractions is the exception and highly valued by dealers. Today the rarest of these Indian pennies are those in the same condition as when leaving the mint. As an example the coin pictured is an "uncirculated" 1884 penny easily worth $58 because of its outstanding brightness and mark free surfaces. Not only is the coin uncirculated but still retains much of the original color of the day of minting, a true rarity. 1884 Indian head penny value is the result of sometimes fortunate circumstances. Your coin survives today by luckily avoiding damage, heavy wear and something as simple as not being lost. At first glance it is hard to believe the coin pictured is over 120 years old. The mint records 23 million 1884 Indian pennies once looked as fresh as this. Surviving with its bright original orange-red copper color is the result of intentionally protecting it from the elements. Gentle and infrequent handling over the years accounts for the lack of any wear, bumps and imperfections to the surfaces. The question, how many old coins remain in gem condition, as when first minted? Today, judging by the values, Indian penny collectors out number the available supply of gem condition 1884 pennies. When a choice 1884 penny was offered at a David Lawrence rare coins auction the level of competition raised the price to $580. The value of this 1884 penny represents top quality meeting the needs of advanced collectors. 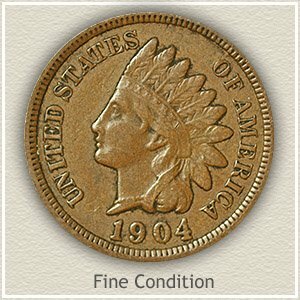 As more and more collectors assemble sets of Indian pennies the condition of each is judged carefully. Values are separated by each coin’s appearance and remaining detail. At times only a small amount of wear, or lack of it separate what is necessary to please the eye of a collector and to pay a higher price. 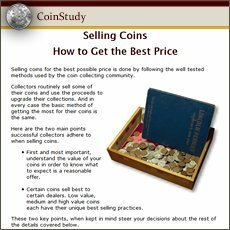 Compare your coin to the images and description finding an accurate value. 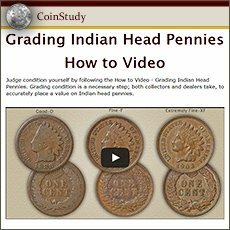 Uncirculated: With the highest demand and 1884 Indian head penny value are coins that never circulated. It is very rare to find coins in the same condition as they left the mint, with no wear to their surfaces. Amazingly there are a select few known with the original bright mint luster radiating across the surface. Confirm your coin is "uncirculated" by examining the very highest points of design. The ends of the feathers and her cheek are two areas that would quickly appear dull and slightly smooth from the lightest of wear. Rotate the coin under a light, wear shows as a disruption in the luster as it travels around the coin. Fine: Noticeable are parts of the hair and headband have worn to the point of merging. Feather details are missing at the ends. Her cheek no longer is rounded. Despite this moderate wear your 1884 penny still has a pleasing look. 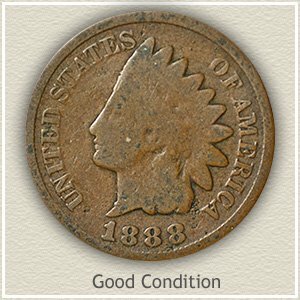 Good: Very worn but still recognizable this 1884 Indian penny is in "good" condition. Even at this low end of the condition scale the main design elements are prominent. Her profile is outlined with some detail separating her cheek and neck. Although very little of the headdress is visible, there is some slight roundness to the feathers. Traveling around the rim all lettering is visible, even if some are faint. $1 to 2 dollars for common dates. With many advanced collectors pursuing Indian pennies the rare dates along with your 1884 Indian head penny value are moving higher. As always better condition coins are especially sought. Today your box of old coins has never been more valuable.